A rendering of the residential development at Pacific and Seventh in Downtown. Courtesy of Holland Partner Group. 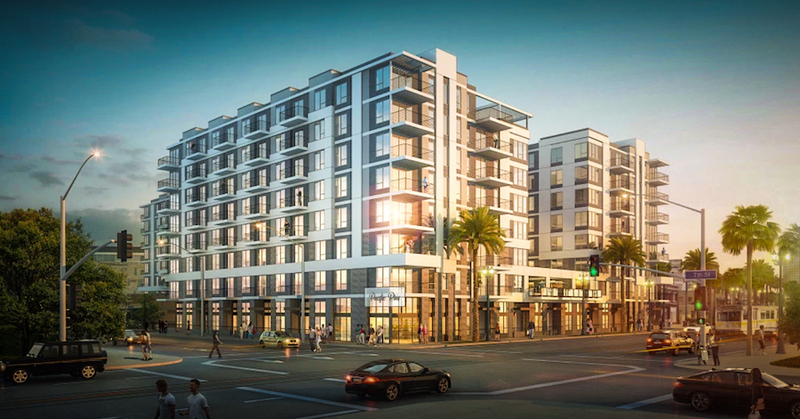 After receiving approval from the Long Beach Planning Commission last June, construction crews have broken ground on an eight-story, mixed-income residential complex at the southeast corner of Seventh Street and Pacific Avenue in Downtown. Headed by Holland Partner Group, the development will bring 271 units (and 341 parking stalls) to two separate buildings connected by a sky bridge. Eleven of those units are set aside for those making up to 20 percent above the average median income, commonly called the moderate income household. This is opposed to the federally-defined zone of low income (80-50 percent of average median income), very low income (30-50 percent of the median), and extremely low income (<30 percent of the median). This allotment of units will include four studio units, four one-bedrooms, and three two-bedrooms. The Pacific Avenue building will be eight stories tall with 194 units, eight of which will be moderate-income units. The Pine Avenue building will also stand eight stories tall and consist of 77 units, three of which will be moderate-income units. The discussion surrounding the “missing middle” in housing is an important one: In terms of our housing crisis, California is largely focusing on building either entirely market-rate housing that is inaccessible to the middle class—let alone lower-income families—or affordable housing that is restricted to certain populations, the middle class not being one of them. While there are more aggressive developers focusing solely on the missing middle market—Scott Choppin and his development company focus on multi-generational households that need affordable four- to five-bedroom units—it shouldn’t be dismissed what Holland Partner Group is trying to do with Seventh and Pacific by including even a minimal amount of affordable units in a complex that is largely market rate. The Vancouver-based residential developer and property owner will be heading the project from start to finish. They’re a “top-down” firm, meaning they oversee everything from design to construction rather than outsourcing to third parties. To mix affluence with the less affluent, no affordable unit will be different than any other and no one will know who is paying what. The project had ambitious beginnings: It required the demolition of the MADhaus warehouse and clearing the vacant lot sold to the group through pawning off of Redevelopment properties three years ago, as well as the relocation of the historic Parsonage House that took place last year.